Venho por este meio falar do primeiro trabalho desta banda Ucraniana, Windswept,que nos traz um Black Metal muito interessante e muito agradável de se ouvir horas a fio. Este The Great Cold Steppe ,mostra que no leste da Europa encontra-se muito boas bandas a produzirem muito boa música para os nossos ouvidos ,e, os Windswept são uma delas. Não percam e vaiam tentar ouvir este grande trabalho,e ainda por cima o primeiro desta banda, dos Windswept, The Great Cold Steppe. I hereby speak of the first work of this Ukrainian band, Windswept, which brings us a very interesting and very pleasant Black Metal to hear for hours on end. This Great Cold Steppe shows that in Eastern Europe there are very good bands producing very good music for our ears, and the Windswept are one of them. 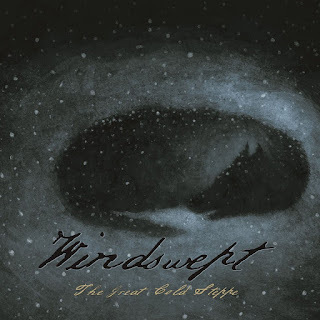 Do not miss and go try to listen to this great work, and also the first of this band, Windswept, The Great Cold Steppe.